Most In Touch EMR users have switched over to us from another physical therapy EMR. At a given time, hundreds of physical therapists are in touch with our sales team, as they deliberate between In Touch EMR and other vendors. We have a great deal of respect for our competitors and, in the end, want to work with clients whom we are best suited for. The good news is – there are a lot of EMR and billing software choices, and most of them are really good products. We were recently the subject of an article on physical therapy software comparisons, where we were compared to another product, OptimisPT Physical Therapy Software. 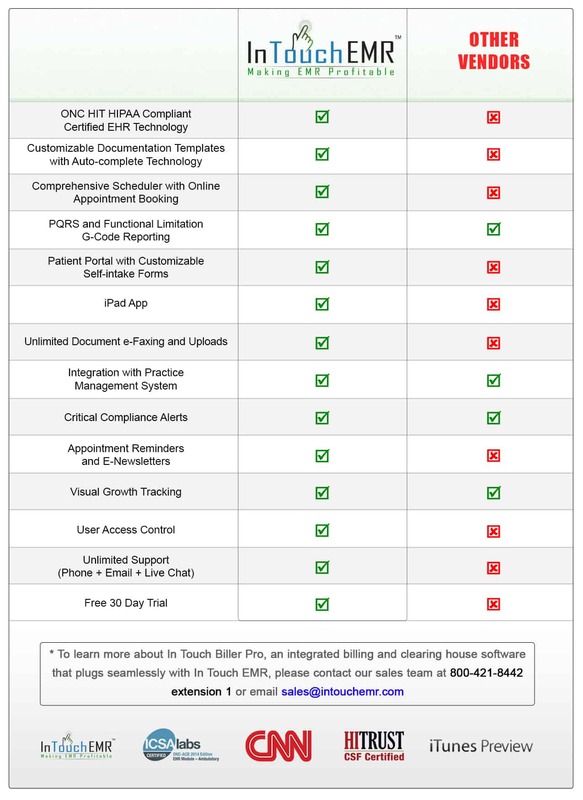 This fair and in-depth analysis illustrated the power of both products, but inevitably showcased why In Touch EMR has rapidly emerged as the trusted leader in physical therapy documentation in 2016. As far as we can tell, other products like OptimisPT physical therapy software also high-quality security protocols and take necessary back-ups of data, but others have not gone through the testing and security and compliance checks that In Touch EMR has. In Touch EMR is one of the few vendors in the rehabilitation space to be listed on Certified Health IT Product List. OptimisPT physical therapy offers data backups, but nothing to match the level protocols and security procedures required for certification by the Federal office of the National Coordinator Health Information Technology. click here to get more information about our certification and the extensive testing processes we have undergone achieve this certification. No other vendor can make this claim, and they generally won’t bring this up (in cases, out of ignorance) mostly because this is not a mandatory certification, it is optional and requires significant investment of time and effort. This certification is a sign of our commitment to a compliant, secure and stable EMR system for your clinic. Schedule a demo with us to get access to this exclusive report. Discover the competitive advantages you get right away with the use of our certified EHR technology. As of April 2016, In Touch EMR has grown to over 1000 users, and the company / founders have been mentioned on CNN, Forbes, Huffington Post, Amazon, been featured as a Cleardata success story, received the prestigious ONC certification, 2015 and 2016 PQRS registry designation, integrated with Microsoft’s cutting edge patient portal technology and initiated groundbreaking healthcare partnerships with companies like Novartis. All of this is possible thanks to clients across the country, who have embraced In Touch EMR. Click here to read more about In Touch EMR in the news. Peace of mind also comes from knowing that the people you’re trusting with your scheduling documentation, and billing solutions have hands-on knowledge of what it means to be a PT. In Touch EMR was founded by Nitin Chhoda PT, DPT and his wife (w ho is also a physical therapist). Nitin is actively involved in the daily operations of the company, and has been a trusted resource in physical therapy software, marketing, and business growth. He is the founder of Referral Ignition, a practice building program that has rescued physical therapy clinics on the brink of bankruptcy and brought them to new levels of success. OptimisPT’s pricing for web-based physical therapy EMR software is based on an entry level monthly charge and then on additional visits. provider. This also includes some fantastic features such as marketing integration, email appointment reminders, and faxing directly through the system. At In Touch EMR, we charge a flat fee per licensed clinician (no hidden fees or surprises) and it includes everything, unlimited claims and notes and infinite custom template creation. We are also a CMS recognized PQRS registry, we automate the reporting of PQRS and Functional Limitation G codes and provide automatic alerts for plan of care expirations, authorizations, progress note reminders and KX modifier alerts. Clients get self-paced video training program on how to get up and running, custom documentation template builder, iPad app – one touch document import, Instant Intake iPad app, unlimited patient manager and patient portal. In Touch EMR and OptimisPT both integrate scheduling, billing, and documentation, but In Touch EMR’s ability to allow the user-creation of custom templates for notes, along with auto text technology. This sets the stage for faster physical therapy documentation, which means your clinicians are more likely to finalize notes right away. Finalized notes mean submitted claims – which means your clinic makes money. While OptimisPT Physical Therapy Software offers somewhat flexible billing and integration, In Touch EMR offers all of this and more. just for you, and cheaper, easier to understand bills make In Touch EMR the right choice.